Children have been left devastated after heartless vandals damaged their chances of winning the Woburn Open Gardens competition. Nicole Ivett, headteacher at Woburn Lower School, says she has been left “deeply saddened” by the crime, which saw the pupils’ garden area vandalised. “The children use it all the time for a variety of their subjects,” she said. “It is an absolutely wonderful area because we have a real focus on outdoor learning. 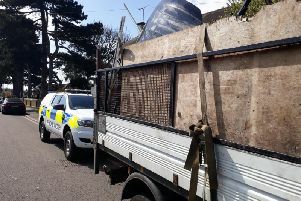 A bench, tables and chairs have either been stolen or engraved with a knife, there are window panes missing from the greenhouse and the children’s bug homes have been destroyed. Mrs Ivett added: “The thing I find most upsetting is that they have emptied out our two water butts which are filled with rainwater for the children to water the plants. “The childen have been working so hard in the run-up to the competition, but now they have taken away their water. Community Police are currently investigating the vandalism, which is thought to have happened between Tuesday, June 9 and Friday, June 12.